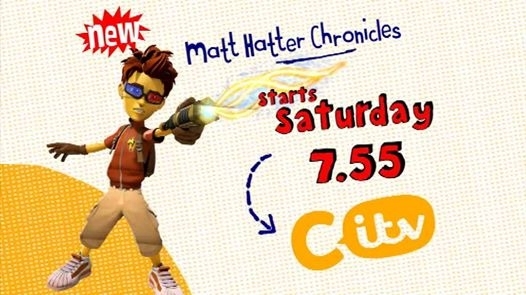 Yep, the new season premiere of Matt Hatter Chronicles is upon us – as season 3 kicks off tomorrow on CITV at 7.55am (prime those Sky+, V+ boxes, etc). As many of you know, I’ve been heavily involved in Matt Hatter pretty much from the get-go, in various capacities – screenwriter, script supervisor and creative consultant – and season 3 has a whole lot of me in it. Season 3 kicks off some big changes for Matt (both as Hatter Hero and schoolboy), as he continues his quest to clean up the Multiverse and free his Grandpa. The balance of power between him and arch enemy Tenoroc seesaws back and forth in the first few episodes to set up an all new ballgame for the series. New villains, new threats, new gadgets (and vehicles) and a new realm of the Multiverse to explore, this series has it all. For more information on the world of Matt Hatter, check out the official Matt Hatter Chronicles website here and their facebook page here for regular updates. And check in tomorrow and every Saturday for new episodes. You are currently browsing the simon furman blog archives for September, 2014.